In a very important way, adaptive analytics processes help companies cope with constantly changing external forces, such as new regulatory compliance requirements, market dynamics and competitive pressures. Analytics are also critical for monitoring internal functions and change programs to provide context, transparency and agility for identifying issues and responding to potential problems before they become emergencies. For example, major regulatory changes including Revenue Recognition (ASC 606 and IFRS 15), Lease Accounting (ASC 842 and IFRS 16), the European General Data Protection Regulation (GDPR), and others are all impacting compliance requirements for companies throughout the world. Analytics are the key for successfully unifying internal processes and data to meet these external demands. With so much external change going on, it’s vital that your organizational sensory and response systems be agile, transparent and comprehensive. To succeed, you need to simultaneously see the big picture and have the flexibility to drill down for detail across a widening range of compliance requirements. 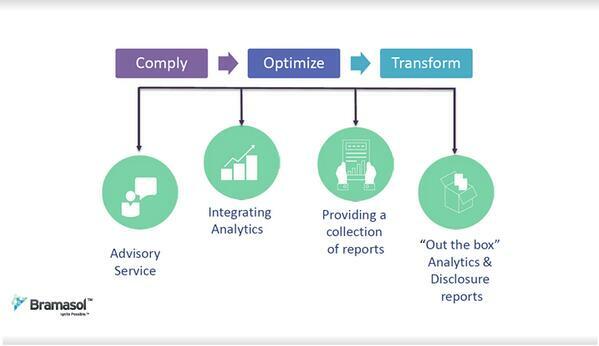 At Bramasol, while working with a broad spectrum of companies across many industries on their compliance and financial transformation initiatives, it has become clear that “analytics” needs to be treated as a core strategy for overall success – with a comprehensive and highly adaptive approach. 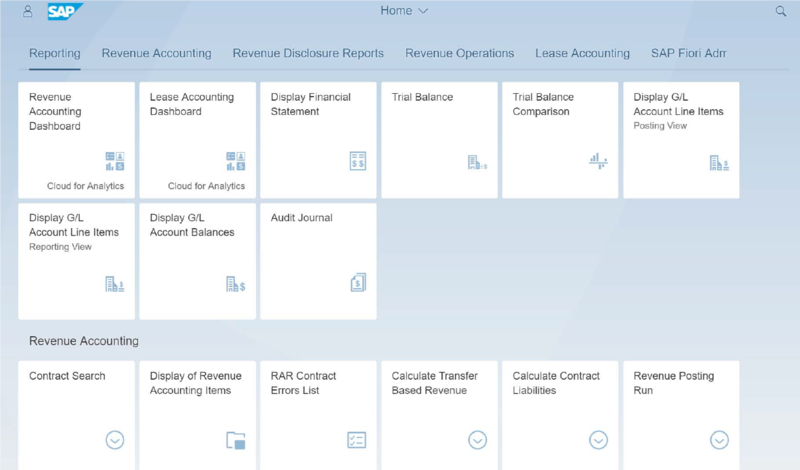 Our go-to analytics technology stack spans the creation of purpose-built tailored solutions for issues such as Leasing and RevRec compliance, combined with user-friendly overall dashboards, such as the SAP tile-based analytics launch pad below. Companies need end-to-end integrated solutions for compliance that fit seamlessly within existing operational and financial systems while providing the detailed information, audit trail, aggregation methodologies and advanced analytics to support disclosure reporting. In addition, company management needs assurance that these end-to-end solutions are capable of being adapted and updated as compliance and disclosure requirements are fine-tuned or to meet special situations. 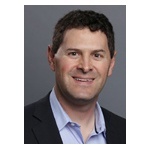 While there is no easy one-size-fits-all solution for all companies, it is useful to leverage core analytics technologies that can readily adapt to unique requirements while also meshing with existing legacy systems and laying the foundation for forward-looking business strategies. For example, we’ve standardized on the SAP Digital Core, SAP Cloud Analytics and S/4HANA because these technologies provide flexiblity, scalability and performance for agnostically integrating and anlyzing data from virtually any existing systems and/or legacy data repositories. In addition, we’ve gone the extra step of creating purpose-built analytics and disclosure solutions for Rapid Leasing Compliance and Rapid RevRecReady Compliance. By leveraging these targeted products, companies that just need quick and easy-to-deploy solutions can get up an running fast for basic compliance while also creating a solid foundation for adapting their analytics to meet future needs. Comprehensive analytics are a key element in any company’s journey of Compliance, Optimization and Financial Transformation. Beginning with advisory services and analytics integration, with pre-defined disclosure reports and purpose-built out-of-the-box solutions, these core analytics tools enable companies to comply quickly and then optimize their operational processes for driving transformational change. Only by creating a multi-faceted sensory and analysis strategy that holistically unifies the entire organization can today’s companies hope to stay healthy and compete in today’s global environment. Learn more by visiting Bramasol’s Financial Transformation solutions.